Attention to all fans of GOT7 and B.A.P! Here is a chance for you to meet your favourite idol group up-close, ahead of the concert. 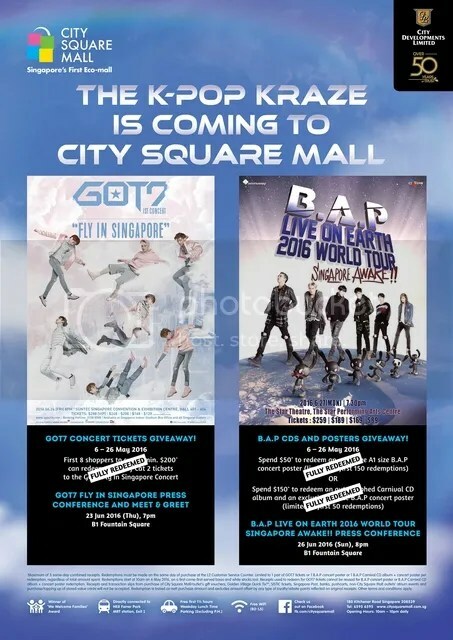 This June, the K-pop Kraze is descending upon City Square Mall with appearances from talented idol groups – GOT7 and B.A.P on June 23 and June 26 respectively. On June 23, multi-talented boy group GOT7 will be making the first landing in City Square Mall, Basement 1 for GOT7 Open Press Conference and Meet & Greet. It will be the septet’s first full concert in Singapore since their debut in 2014. On June 26, the much-awaited hip hop boy group B.A.P will be making their second landing in City Square Mall for B.A.P Live on Earth 2016 World Tour Singapore Awake!! Press Conference. The sextet last visit was in 2014 when they held a fanmeet at the mall prior to the 2014 series of Live on Earth. For more information on the events, do visit City Square Mall official Facebook page.